Probably people had built an earlier, smaller octagonal baptistery here around 700 AD. This is where Catholic priests baptized Christian babies in medieval Florence. This baptistery is also called San Giovanni, the Baptistery of St. John. That’s because Christians believed John the Baptist was the holy man who baptized Jesus Christ. Catholics may have built the earlier baptistery to encourage Lombards to convert to Catholicism from Arianism. When the Lombards first arrived in Italy, they followed a kind of Christianity called Arianism. But most of the people in Italy were Catholics. Pretty soon, the Lombards also gave up their Arianism and became Catholics. They may have used this earlier baptistery as their cathedral, too. 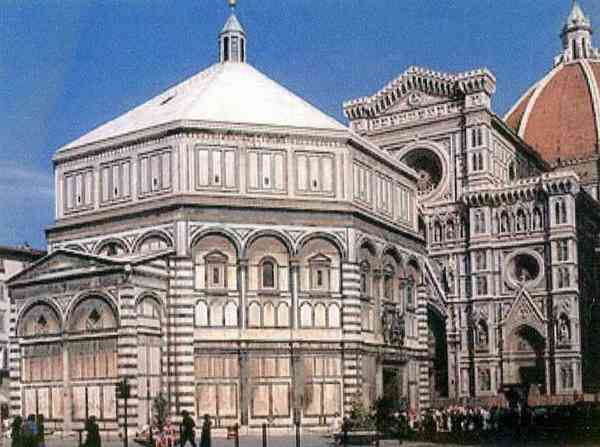 For four hundred years, the first Florence baptistery was fine. But finally that baptistery seemed too old, and too small. Under the peaceful rule of Matilda of Canossa, Florence was getting richer. People wanted to show it with a big new building. They decided to rebuild. So the people of Florence built this new octagonal baptistery in the Romanesque style around 1100 AD. The builders covered the outside with patterns of red, white, and green marble. Where did they get the marble? The white marble came from the wonderful Carrara marble quarries right outside Florence, so that was easy to get. Most of the green marble comes from Prato, only a few miles further away. A lot of the red marble came from older Roman temples and basilicas that the builders tore down to use for materials. 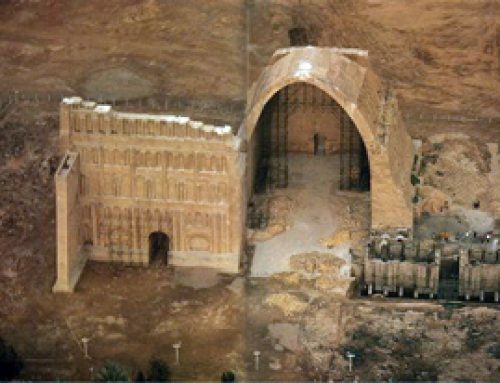 Medieval Christians thought it was super appropriate to take materials from the bad old days before Christianity and make them holy by using them in a Christian building. Plus, you had to import red marble to Italy from far away. Using it in their baptistery implied that the people of Florence were rich enough to get expensive, imported marble. The Florence baptistery’s architect probably learned this way of patterning buildings from earlier buildings in the Islamic Empire, across the Mediterranean from Florence. The Dome of the Rock in Jerusalem, from the 600s-700s AD and the Great Mosque at Cordoba (987 AD) both have stripes like these. There weren’t so many big buildings being built around the Mediterranean in the High Middle Ages, and probably Florence’s architect visited or found out about as many of them as he could before he started designing his own building. 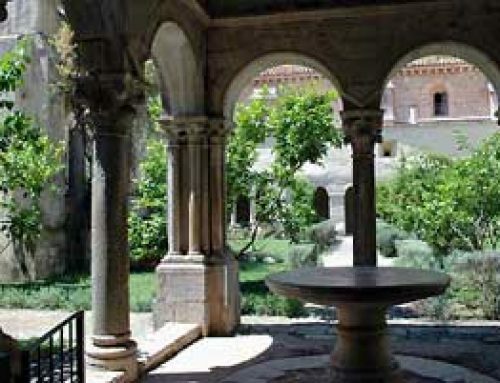 The octagonal/round shape was also common in earlier medieval buildings. The first one was the mausoleum of Galla Placidia in Ravenna (ca. 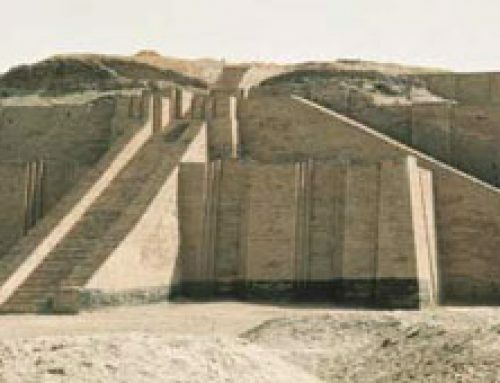 450 AD). Then Hagia Sophia and Hagia Irene in Constantinople from the 550s both had octagonal or round parts. A little later, the Dome of the Rock in Jerusalem (600s AD), and Charlemagne’s chapel at Aachen (ca. 800 AD) were octagonal or round again. 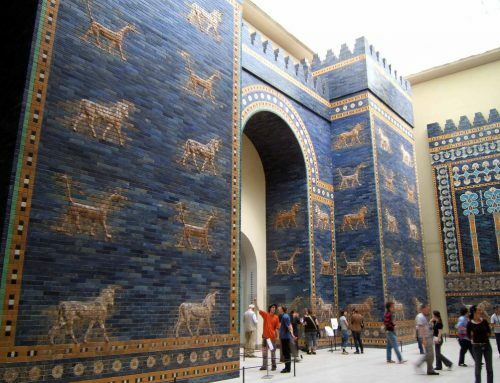 Most of these earlier buildings were covered with mosaics on the inside walls. And so is the baptistery of Florence. 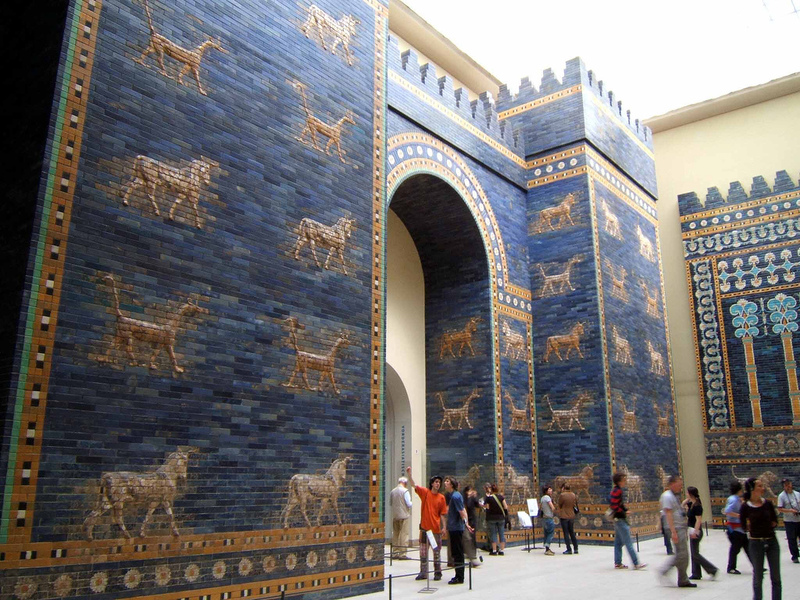 The mosaics here aren’t from the original building. 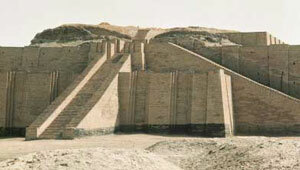 They were done more than a hundred years later, in the 1200s AD. By that time, Florence was an independent republic, and even richer than it had been under Matilda. Florence was getting rich from making and selling wool cloth. 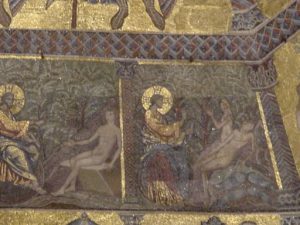 The Cloth-Maker’s Guild became the patrons of the baptistery, and the rich cloth-makers who belonged to the guild paid for the mosaics. Visiting artists from Venice made some of the mosaics. Artists from Florence like the famous Cimabue (chee-MA-boo-ay) did others. Who was baptized in the Florence baptistery? Many famous people from Florence were baptized in this great baptistery. 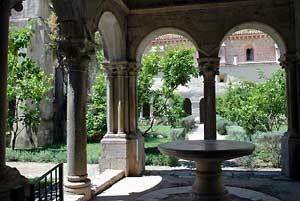 The poet Dante, for example, was baptized here about 1265 AD when he was a baby, soon after the mosaics were done. Florence became even richer in the Late Middle Ages, thanks to trade across the Mediterranean and a growing business selling wool cloth and paper. So the Florentines (the people of Florence) wanted to show it with a fancy new set of doors for their old baptistery. Today, the Florence baptistery has fancy bronze doors on three sides. 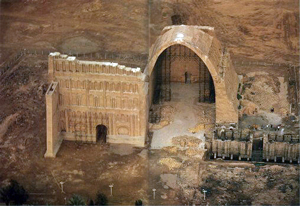 The artist Pisano molded one set of doors, using lost wax casting, in 1330 AD. 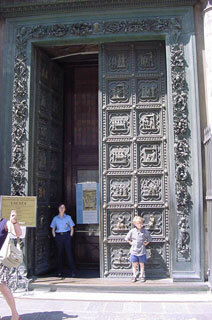 Ghiberti molded the other two sets of doors in the 1400s. Ghiberti (you pronounce it gi-BEAR-tee) won a competition against Michelangelo to see who would get to carve these doors when he was only 23 years old. I think looking at this panel of Cain and Abel you can see why he won! When Michelangelo saw Ghiberti’s east doors, he called them the “Gates of Paradise”. 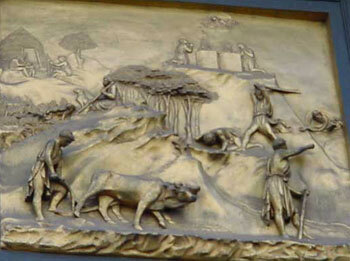 Florence baptistery: A door panel by Ghiberti showing Cain and Abel. You might want to compare this Florence baptistery to the baptistery in Pisa, very close by, which Matilda of Canossa and the people of Pisa built just after this one. The Florence baptistery is just across from the later Duomo, or Cathedral of Florence. Cite this page: Carr, K.E. Florence Baptistery – Romanesque architecture in Italy. Quatr.us Study Guides, July 30, 2017. Web. April 21, 2019.